Basil, Ocimum basilicum, is one of the most popular herbs, valued for its ornamental, culinary and medicinal uses for over 3,000 years. For many gardeners, fresh-from-the-garden tomato slices with shredded basil are the taste of summer. 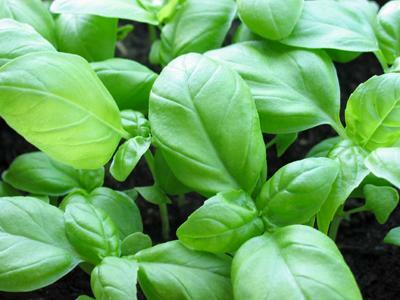 Basil is an herbaceous annual with stalks of white flowers. Its habit is bush-like, with a tough stalk. Like other members of the mint family, it has a square stem and opposite leaves, and is extremely aromatic. Its flavor is spicy-sweet with a hint of anise. It is native to Asia and the Middle East, but has long been grown in Europe as well. It's an especially important ingredient in Thai and Italian dishes. There are many varieties with different flavors, leaf colors and sizes. Grow in full sun, in well-drained, organic soil. If your soil is less than ideal, add compost. A sunny window is also a suitable place, especially in cool climates where it might languish outdoors. Propagate by seed, sown indoors four weeks before the last frost date for your area. You can also buy transplants, but you'll have more varieties to choose from it you start from seed. Seeds are small and a packet usually contains more seeds than you need, but they keep for four years if stored in a cool, dry, dark spot. Sow the seeds shallowly. Shortly after planting the seeds take in moisture and a gelatinous coating forms around it, protecting it from drying out. Germination takes place in 4-7 days. Plant seedlings 12 inches apart in the garden after all danger of frost is past. Plants grow 1 to 3 feet. Harvest the tips of the braches often to keep fresh leaves coming, and pinch off any flower stalks, as plants that go to seed cease leaf production. Basil is seldom troubled by pests or diseases. Harvest in early to mid-summer. Use fresh in pizza, soup, bruschetta, and salad. It pairs well with tomatoes, zucchini and cheese. Add it to sandwiches in place of lettuce, or shred into stir-fry, sauce and dip. A delicious dressing or dip for bread can be made by soaking minced basil leaves in good olive oil. Pesto is the most famous use, combining nuts, cheese, olive oil and lots of minced leaves into an amazingly fragrant topping for pasta or crostini. Pesto can be frozen in ice cube trays for later use. Leaves can be dried for use throughout the winter. Seeds are used in a Thai drink with honey. The flowers are also edible, and if you forget to pinch your plants back you might try plucking the flowers off the stalks and sprinkling them over salad or using them as a garnish. They have a milder, sweeter taste than the leaves. Though the herb is not often used medicinally now, it is good for the stomach. Its oil is used to make incense and perfume. Some varieties are very ornamental, having large ruffled leaves like 'Lettuce leaf' or deep purple leaves like 'Purple ruffles' or 'Opal'. These are attractive additions to container plantings. The smaller, mound-shaped types are a cute edging plant, or sweet in a terracotta pot on their own. 'Fine Green' also called 'Piccolo Verde Fino,' has tiny, light green leaves and a neat mounded habit. 'Minimum' or Greek basil is also petite. The leaves can be stripped off the stem and used whole. 'Lettuce leaf' is a very productive plant with huge leaves. 'Genovese' is slow to bolt and has spicy, dark green leaves. 'Lemon' and 'Lime' have a tangy citrus flavor. They are delicious chopped and sprinkle on fresh melon or sorbet. Thai basil 'Siam Queen' is very spicy, with long, thin leaves and purple stems. This is the perfect choice for stir-fry, curry and Asian-style soups.